It is not uncommon for most listings to spend 65 days on the market. This number varies depending on market conditions, however it is not difficult to do the math. All you need to do is take a look at homes listed in your zip code and count the number of days from the listing date to the pending date. That will give you a strong idea of the average "DOM" (days on market) for local listings. As a seller, you might be wondering how you can decrease the DOM for your potential home sale. While there are times when there is no logical explanation as to why a house sits on the market as long as it does, price is definitely a factor in the expedient sale of ALL listings. 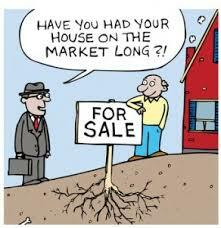 The market ultimately determines price and your home is worth only what a buyer is willing to pay. Smart Pricing is an art form. Experienced agents know how to lure in prospective buyers with smart pricing strategies and when a home's price might need a drop. Price range and flexibility is everything and a smart agent will know how to build potential contingencies and price drops into your bottom line. You've heard it said before: "location, location, location." A desirable zip code, the best schools and conveniently located freeway access are usually in the top three of a buyer's wish list. Such perks will increase your home's desirability. The main thing is that you, as a seller, stay realistic about your location and what your zip code can and cannot offer and then price accordingly. If the barn needs painting... Common sense dictates that homes which are in good condition and well maintained will likely sell quickly. If your home needs repairs, a fresh coat of pain or update landscaping, it would be worth your time and money to do the necessary work. Avoiding the repairs will only cost you in the long run and your home might never sell as the appeal factor won't be as high for prospective buyers. While we live in the DIY age, a complete overhaul is a totally different ballgame and not normally one in which buyers like to play. Current housing market conditions are everything when it comes to the expedient sale of a home. Homes sell faster in a seller's market as competition is increased among eager buyers. In a buyer's market, the opposite is true as inventory is greater and buyers do not have to act as quickly. Consult your experienced professional realtor to determine current market conditions and best strategies for selling your home quickly. Related: "8 Tips to Sell Like a Boss"